One woman's journey to intellectual liberation through the minds of others. Habit was a fascinating read, one I will need to read again to really capture the whole picture. 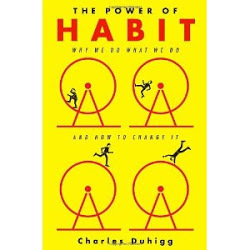 Mr. Duhigg breaks our habits into a 3-point routine: cue, habit, reward. Basically, for every habit is a cue we recognize to play out a habit that comes with a reward we can even crave in advance. Cravings might be a sugar-high, a gambling fix, even a runner's high. We actually experience the enjoyment of these sensations before we have even followed through with our habit - eating, gambling, running, etc. Most fascinating was how why a habit may not be predictable, it can be changed or altered no matter how ingrained a habit is. If you are conscious of your habit, you have a choice in how you participate with your habit. Such as eating too much, smoking too much, getting angry too easily, etc. The author even goes into details about how your favorite stores can predict your buying trends and cater to their desires before you even know you want to consume something. Have a rewards card in your wallet from a grocery store? You are rewarded to continue using your card, meanwhile the store is collecting immense amounts of data about what you buy and when. Those little coupon books you receive in the mail are actually curated just for you and your buying trends as to encourage more buying. All based on your simple weekly grocery shopping habits. I am a woman on a mission to read 200 books. I don't know that I will accomplish my task within a year but I am liberating my intellectual capacity. © 2012-13 Andrea Wilborn's Thoughts powered by coffee. Awesome Inc. theme. Powered by Blogger.